Game Week 34 is nearing its culmination with only a solitary game remaining. Several matches took place over the weekend with those games having a huge bearing at the top and the bottom of the table. On Friday evening, Leicester City took on Newcastle United at the King Power Stadium. The Foxes didn’t get the desired result as they let the Magpies nick a 1-0 victory. Ayoze Perez came up with the winning goal for the visitors. Tottenham Hotspur started the action on Saturday and put four past a hapless Huddersfield Town. Lucas Moura bagged a hat-trick whereas Victor Wanyama popped up with the other goal. Spurs’ London neighbours, Fulham finally got a win under their belt as the Cottagers won 2-0 against Everton. Tom Cairney and Ryan Babel made the net bulge for Scott Parker’s men. In another game, Brighton were thrashed 5-0 at home by Bournemouth. Dan Gosling, Ryan Fraser, David Brooks, Callum Wilson and Junior Stanislas were the scorers for the Cherries. While the victory helped Bournemouth move up to 12th, the defeat left the Seagulls flirting dangerously with the relegation zone. Southampton and Burnley were also on the winning side at the weekend. While the Saints got the better of Wolves 3-1, the Clarets dispatched Cardiff City 2-0 at Turf Moor. Nathan Redmond’s twin strikes in addition to Shane Long’s 70th minute goal helped Southampton reign supreme over their rivals. For Nuno Espirito Santo’s charges, Willy Boly made the net ripple. As for the Clarets, Chris Wood scored a goal in each half to pile further misery on Cardiff. The Bluebirds now have their task cut out in trying to fly out of the drop zone and into safe haven. The late-kick off on Saturday saw Manchester United lock horns with West Ham at Old Trafford. Though the Red Devils were quite some way off their best, they got the job done through a Paul Pogba brace. The Frenchman struck either side of Felipe Anderson’s goal to ensure a fortuitous 2-1 victory for the hosts. On Sunday, Manchester City travelled to Selhurst Park in a bid to keep their title aspirations alive. The Cityzens did so as they comfortably swept aside the Eagles’ challenge to post a 3-1 victory. Raheem Sterling scored twice for the visitors while Gabriel Jesus made the net bulge in the dying minutes of the game. For the hosts, Luka Milivojevic pulled one back but it merely acted as a consolation. The blockbuster game of the weekend featured Liverpool clashing swords with Chelsea at Anfield. 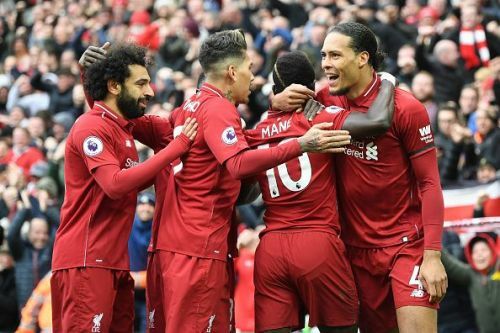 Though the game was perceived to be the Reds’ toughest in their title run-in, Jurgen Klopp’s men made light work of the West Londoners. Sadio Mane and Mohamed Salah struck just after the restart to put the game beyond Chelsea’s reach. The win also enabled the Reds to re-establish their two-point lead at the perch of the table.